LA RIOTS – SF IV Tournament – Streaming Live! 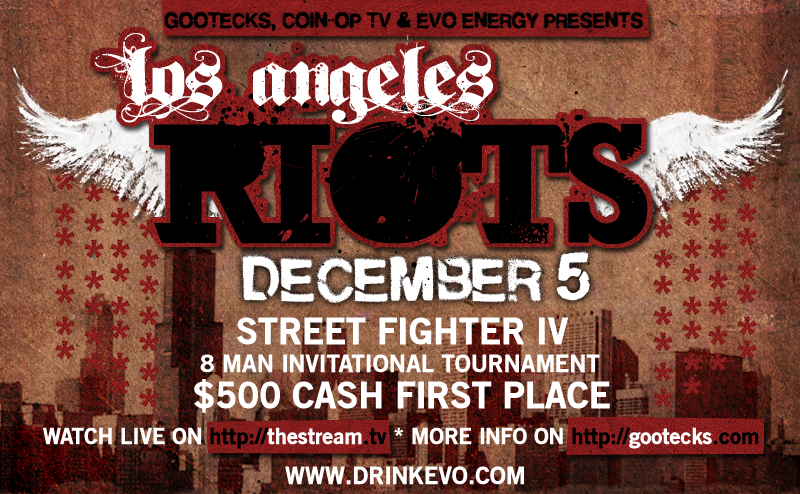 LA RIOTS – Street Fighter IV Tournament is coming Saturday Dec 5th 2009 to www.TheStream.TV brought to you by Gootecks, COIN-OP TV and Evo Energy. Eight lucky SFIV players in the Los Angeles have been invited to take place in this elimination match with the winner going home with a $500 cash prize! This event will be live and streamed with multiple cameras and commentators before, during and after the matches. More information as we get closer – but save the date now!